Barnabas Collins has driven a stake through a vampire’s heart, beaten a werewolf into submission with his cane, bricked up an enemy behind a wall, and burned a witch to death with a torch, and Dr. Julia Hoffman has done everything that Barnabas did, except backwards and in high heels. So you’d imagine that these two heavyweights would have no problem dealing with an awkward social situation, like if a guy shows up at your friend’s house in the middle of the night, and you can’t get him to leave. And yet here they are, stymied. Us Weekly was right; celebrities really are just like us. “I’m not making you uncomfortable, am I?’ says the unwanted guest. “Not at all,” they stammer, as they adopt the most uncomfortable postures you can imagine. According to the clock on the wall, it is 1:10 am, and our heroes are desperately trying to figure out how to get this guy to skedaddle. His name is Ned Stuart, and he claims to be an old friend of teen-dream werewolf Chris Jennings. In fact, Chris was once engaged to Ned’s sister, who, if she’s anything like her brother, must be a real ball of fire. Ned popped up here at Chris’ cottage about an hour ago (time of arrival: 1:10 am), and when he was told that Chris wasn’t home, he announced that he was happy to wait until the occupant returned. Then he parked himself in an armchair for the duration. “You seem a little nervous,” Ned observes. “That’s true,” Ned says, and then he just stares off into space. 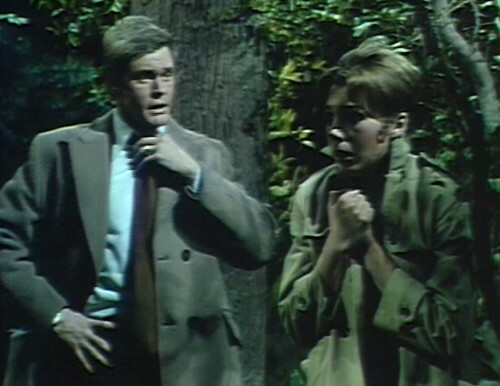 Now, Barnabas and Julia know that Chris has turned into a werewolf this evening, and he’s currently locked up in the secret room in the Collins mausoleum, chasing his tail. The only reason they’re even here is that Chris is a member of Murder Club, their social organization for serial killers who cover up for each other’s crimes. So it’s hard to get a really worthwhile conversation rolling. The only thing they have in common is that they both know Chris, and nobody wants to talk about him. They’d offer Ned a drink, but the whiskey bottle has strychnine in it, which is pretty much the only thing that could possibly make this party any worse. 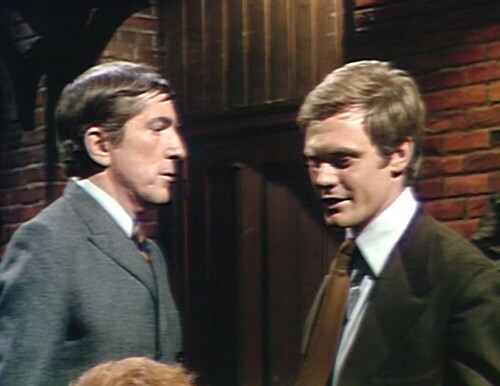 Barnabas says that it wouldn’t be proper to leave a stranger in Chris’ house, and Ned smirks, “Yes, and it is important to be ‘proper’ in New England, isn’t it?” So, great, he’s one of those guys who wants to lecture everybody about how middle class and phony they all are. This is a nightmare. It’s still 1:10 am, by the way. They made a big deal about the time yesterday, with three consecutive shots of different clocks all showing the hour. At that point in this eternal minute, Ned was talking to Carolyn up at the main house. Now he’s come all the way out to the cottage and annoyed Barnabas and Julia, and the clock has stubbornly decided to double down on 1:10. I guess time doesn’t fly when you’re not having fun. Okay, then. This leaves them with exactly zero topics of conversation. The time is 1:10 am, and holding. 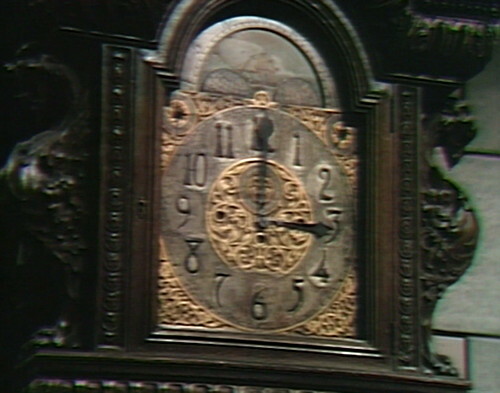 But then, in a surprising burst of speed, the grandfather clock in the Collinwood foyer has sprinted forward to 3:00. This gives the Collinwood clock a strong lead. The clock at Chris’ cottage had better get a move on if it wants to catch up. 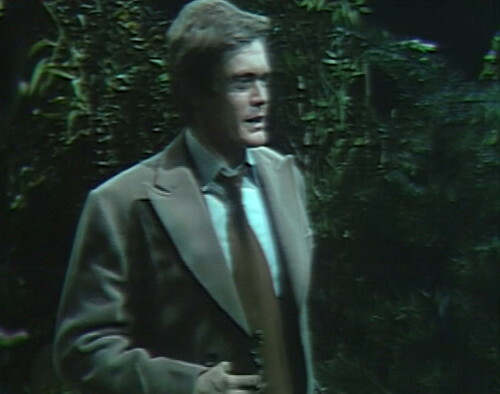 This is one of those long nights on Dark Shadows that drag on forever, and nobody ever sleeps. This particular night started last Friday, and continues through Thursday, when they declare that it’s 5 am, and everybody can put on real clothes again. Maggie — still wide awake for reasons unknown — finds David sitting at the desk in the drawing room. He says that he couldn’t sleep, and she counters, “That’s no reason to be roaming around the house.” David points out that he’s not roaming around the house, so he has her on a technicality. David explains that he’s writing a story, and somehow the scene transitions into a creative writing class. David is currently under the influence of angry ancestor Quentin Collins, who’s using the children as pawns in a plan of uncertain scope. Quentin is trying to drive everybody out of the house, but he also seems to have something against Chris for some reason. It’s all very complex. Anyway, David’s story is about a man who turned into an animal because of a curse, and he killed people that he loved. The man found a secret room that he could hide in, but somebody let him out of that room, and he was killed by a hunter. So I guess that means that Quentin told David about Chris, and now he wants David to tell Maggie that Chris is a werewolf. I don’t know what Quentin thinks Maggie’s going to do about it, but this is advanced ghostcraft and I’m not an expert. 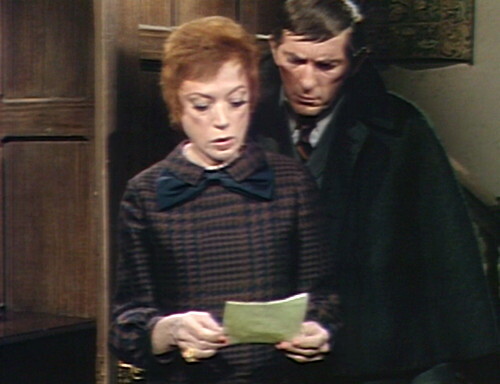 We head back to the cottage, where Barnabas and Julia look more miserable than we’ve ever seen them. I think Barnabas was perkier than this on the night his mother drank poison. So maybe Ned is right; perhaps these two really are too concerned with New England manners. They’ve actually murdered people and brought them back to life, but they’re too polite to chase this guy out of the house with a broom. How hard is it to tell Roger Davis to get the hell out of your life? Barnabas finally hits on a winning formula. He says, “Dr. Hoffman and I were in the midst of discussing a book that we’re writing when you arrived,” and Ned apologizes and excuses himself. I don’t know why everybody’s a writer all of a sudden, but that appears to be an acceptable excuse for any number of furtive late-night shenanigans. I need to keep that in mind, next time I’m stuck at a party with Roger Davis. Now, you’d think that Barnabas and Julia would be utterly thrilled to find themselves once more in a Ned-free environment, but look at them, they’re still upset. I guess you don’t shake off a thing like Ned Stuart in a hurry. They discuss the question of whether Ned knows Chris’ big secret. Barnabas says, “Well, there’s no point in speculating,” which is going to put a serious dent in their daily planners. What are soap opera characters supposed to do, if they’re not allowed to stand around speculating? The entire industry would grind to a halt. Meanwhile, David’s run off into the night — probably just remembered a downtown open mic poetry reading or something — and Maggie’s out in the woods, looking for him. She runs into Ned, and she shrinks back, mistaking him for his lookalike, Jeff Clark. “Don’t come near me!” Maggie shouts. “Stay where you are!” It’s not clear why Maggie would be frightened of Jeff, who’s one of the few male characters on the show who hasn’t actively tried to harm her or her family. But Ned reassures her that he’s a whole different dude, and asks if he can help. Suddenly, Ned’s whole attitude has changed — he’s gentle, and helpful. Are they thinking about pairing Ned and Maggie? Sweet Jesus. Is Ned and Maggie a thing? That’s one of the downsides of having a functional sense of televisual literacy — you see an unattached male character and an unattached female character in the same location, and you instantly jump to the obvious conclusion, which is that they’re going to start dating. That’s what happened with Chris and Carolyn a few months ago, and Maggie’s boyfriend left the show in January, so, yeah. New couple, I guess, unless somebody knows a way to stop them. 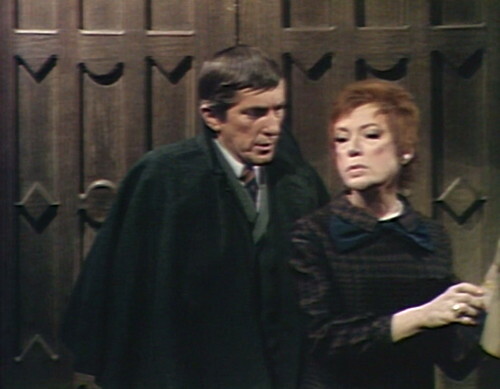 Barnabas and Julia get back to the house, still chatting about the connection between Ned and Chris. I thought we’d agreed not to speculate, but here they are, speculating away. This isn’t where Barnabas lives, by the way. I have no idea when he’s planning to go home. They are super serious about their nightlife in Collinsport. Entering the drawing room, they find the story that David wrote, and they start on a new round of speculation. 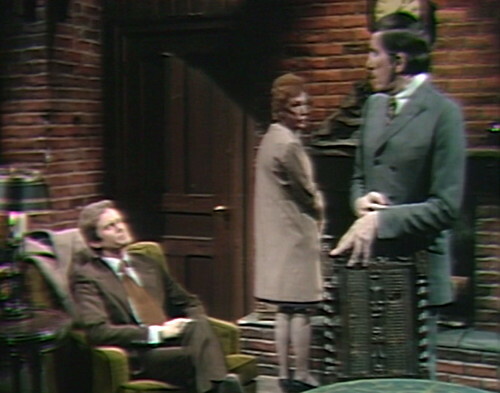 Barnabas: Well, if we’re to take this story seriously, David knows Chris’ secret. Julia: I was hoping you’d say it was just a wild coincidence. Barnabas: I don’t see how it could be. So now we’re doing literary theory, maybe some Roland Barthes Death of the Author stuff. This is what happens on Dark Shadows these days when they don’t really have anything to do; they sort of shuffle people between sets and hold seminars. Back in the woods, Ned has now fully invested in this crack-of-dawn scouting adventure. He’s clearly hoping that something’s going to come of all this; you don’t stay up all night looking for a little boy that you don’t even know unless you’ve got some kind of finishing move in mind. This is actually a pretty slick move. You get back to the house, and then you say, you think he might be inside? How about upstairs in your bedroom? You know kids, he could be hiding anywhere. But then they hear some rustling in the underbrush, and Ned reaches into his pants and pulls out a revolver. This is utterly baffling, even by Ned Stuart standards. They’re looking for a little boy who’s hidng in the woods — they hear something — and he starts exercising his second amendment rights. Fortunately, Ned holds his fire, and the animal rustling in the bushes gets to continue doing whatever it was doing. Ned turns back to his date, revolver in hand. This is what happens when you give a gun to an actor; they treat it like any other prop, just waving it around and gesturing with it. Actors tend to point guns at whoever they’re talking to, so he’s aiming it directly at Maggie’s midsection while they talk things over. So that’s how Ned Stuart ends up taking Maggie home at gunpoint. It’s not one of the all-time great ways to wrap up a date night, but it’s getting late and everyone’s tired. I wonder what time it is, over at Chris’ place? Tomorrow: The First Theremin Era. 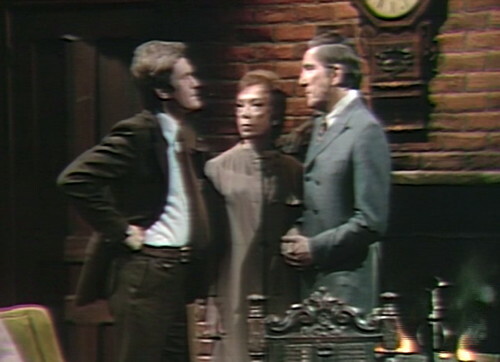 When Maggie and David are yelling at each other at the end of act 1, the camera wobbles around unsteadily. 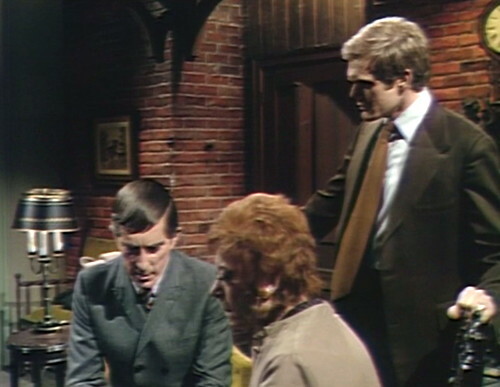 When Ned gets his coat and tells Barnabas that he’ll leave, the camera is aiming too high, and you can see the top of the cottage set, including the boom mic. Outside Chris’ cottage, the set is clearly just a painted flat with a tree outside the door, and a bush outside the window. When Maggie asks Ned why he has a gun, you can clearly see the outside of the mausoleum set just a few feet behind Maggie. There’s no other indication that they’re supposed to be near the graveyard. Collinsport was in fact the first city to advocate open carry laws. (In this case, arguably, it might have been a step up). Also, I love the mental image of Danny trying to avoid the relentless, inexorably advancing Roger Davis at a party. Well, if he’s Dan Curtis’ favorite, his “pet” as Roger Davis alluded to in one interview, then it’s all but impossible. You can kill him off, but he’ll be back, knocking at your door a month later with a fresh moniker and a whole new series of probing questions. You can travel back in time to another century, but he’ll find you. Roger Davis is your darkest shadow. Regarding the possible pairing of Davis’ character and Maggie Evans, this was reportedly discussed among the producers and writers around this time. When she found out about this, Kathryn Leigh Scott was so indignant that she threatened to leave the show. So, when Maggie is shouting to Ned, “Don’t come near me! Stay where you are!”, this apparently was not acting on the part of KLS. I like the idea that the most feared and dreaded being with supernatural powers of resurrection was not Barnabas, nor Angelique, nor the Leviathans. She did get stuck with him in HODS, so she paid her dues. Roger Davis is never successfully paired with an actress for the remainder of his run on the DS series. He also, perhaps gamely, plays characters we simply can’t help but loathe. Works much better that way, I think, as opposed to characters like Peter/Jeff, who the audience was supposed to sympathize with. It’s much easier to dislike a character played by Roger Davis than to like. 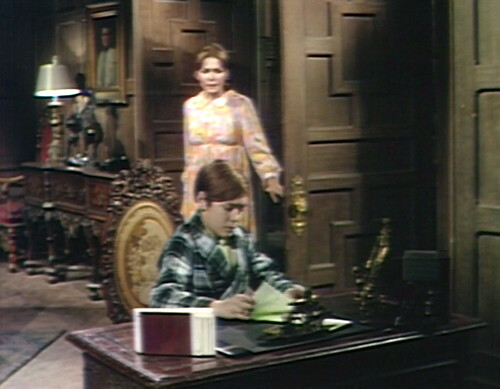 Oh, it amuses me when Barnabas tells Ned that Julia and he are working on a writing project together in the middle of the night. Speaking of “proper New England behavior,” would a single man and a single woman spend this much time together, often alone, and not be considered a couple? Even today, platonic male and female BFFs on TV are rare. They honestly are written like they’ve been married for years. The other alternative is that they’re close siblings. 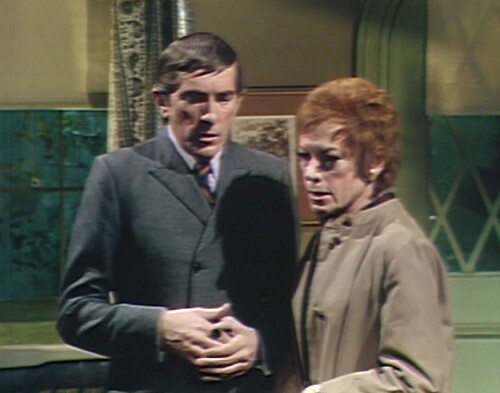 Julia usually says things to Barnabas that only an elder, protective sister would. Julia’s “love ” for Barnabas can even be played off as familial except for later in the series, but those moments always feel like missteps. Julia in love with Barnabas, who doesn’t return her feelings, creates a power imbalance, I think, and I prefer Julia and Barnabas as equals. Although ,let’s face it, Julia is really running the show. 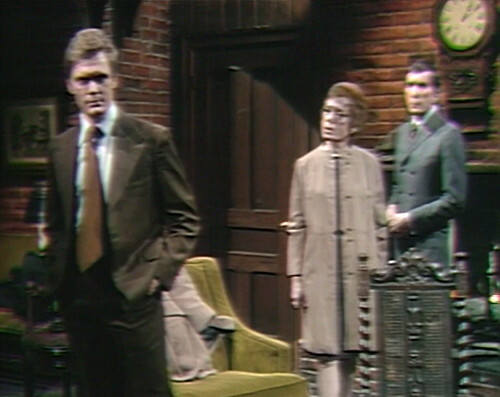 starring Roger Davis, as the thing that wouldn’t leave, no matter how much we begged him to go…. 2 Adopt an air of insufferable snobbishness (For those of you who don’t already have one). 3 Say things like “Well, Mr……..Stuart, was it? It’s a little late at night for unannounced social calls, don’t you think? Perhaps you’d prefer to return at a more socially acceptable time of day, like say four o’clock in the afternoon? In the meantime, we’ll let Chris know you were here. Goodnight, Mr Stuart, that will be all. …lol Richard. Roger was correct. 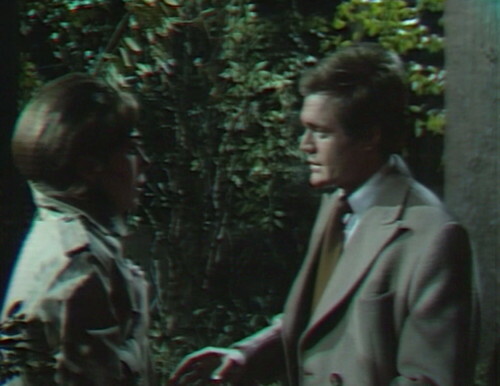 It is as if Julia and Barnabas stop by Ned’s house coming from the club. Thought that Dr Stokes had a theory about Peterjeff ‘borrowing’ a 1969 body to use for the visit, and returning it after the joyride? This crossed my mind the other night when a clueless Roger berated and humiliated Barnabas over the stolen ledger incident. B looked so wounded. Come on! Show some vampire backbone! Btw – why are the writers making Liz and Roger so clueless? Very annoying that these two characters cannot fathom the possibility that something could be amiss with David. Love having Roger back though, Collins that is, not Davis. I think there was a collective groan when Carolyn opened the door to that surprise. I can’t suspend disbelief for this. I could happily accept him again as Peter/Jeff with amnesia body borrowing Ned, not a completely new character. eesh. My heart sunk when Roger Davis appeared at the door. Dan Curtis’ loyalty to him is perhaps the show’s greatest mystery. Yes, he’s good looking, but in a bland, J.C.-Penney-catalog-from-1970 kind of way. He’s perfect for selling suits, pajamas and underwear. 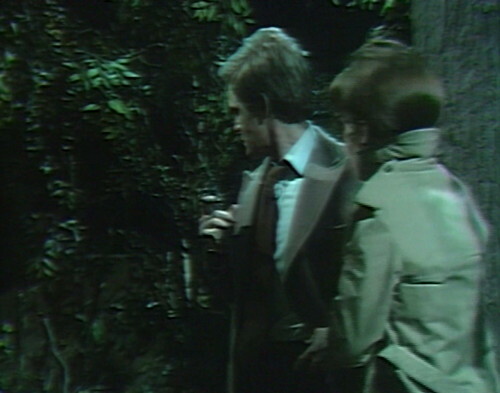 “This isn’t where Barnabas lives, by the way. I have no idea when he’s planning to go home.” Well, in Barnabas’s defense, he was planning to go home–had his suitcase packed and everything–earlier this evening that started two or three weeks ago, before all hell broke loose (so to speak). Barnabas the uncle butler is no longer needed…but Barnabas the junior detective is on the job now, so I guess we can give him at least another night in Collinwood. But wait…wasn’t he maybe staying in Roger’s room? 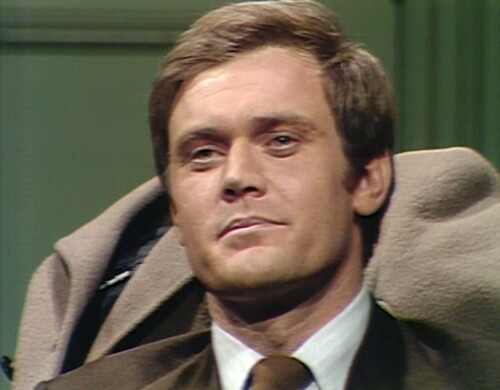 Now that Roger’s back, what will he think when Barnabas slips into bed next to him? I suppose it depends upon your definition of ‘uncomfortable’…My first thought was that this might be some new plot of Quentin’s to chase everyone out of Collinwood, but then HE’D be stuck with Ned. They cannot pair up Ned & Maggie – the thought of Naggie (or Med) brings the terror too near. i never stopped laughing through this one, Danny. Most uneasily portentous (and unmentioned) moment in this episode: when Maggie finds David at the desk in the drawing room, and while Maggie tries to fathom what’s up with David, he says “you know, Maggie, you’re very pretty…”. Show could have taken a whole new direction there, with David developing a relentless if age-inappropriate crush.